"Last night I dreamt I went to Mandalay again"- the film Rebecca begins with one of those lines that almost sums up the entire sense of one of the characters. Its famous but it should be thought of more than it is- Joan Fontaine in that first scene talks about a dream she has about returning to the doomed and ghostly wreck of the house she once persuaded over- its significant that she describes it like a dream or as a tourist might on returning to a place that they had loved- for this second Mrs DeWinter is significant for the fact that she is always a tourist through the film. To invert Marx's famous quotation- in the film history repeats itself first as farce and then as tragedy- the second Mrs DeWinter travels twice to a new aristocratic surrounding as a companion of an inhabitant of those surroudings. In both cases though the story might superficially end happily, it is not without cost- but the conclusion is the same in both cases Mrs DeWinter acquires a new companion- the first episode is interesting though and well worth analysing in itself for some indications as to the way that the second historical account plays out- as ever with Hitchcock the architecture of the film is crucial to getting a proper understanding of it. Running through the Monte Carlo series of incidents is a comedy of misapprehensions and vulgarity. Hitchcock can be merciless in his mockery of older aristocratic women- a particular vicious example of the general species occurs in this film- this is the woman to whom Joan Fontaine is appointed companion to and she treats Fontaine's character with scorn and ridicule, barely acknowledging the personality that is sitting besides her, inviting all the rest of the characters to pay her young companion as little attention as she does- Fontaine during this sequence is wooed by Mr DeWinter- who woos her with a mixture of command and inscrutable generosity. By treating her as a person- talking to her, offering her breakfast- even as a subjugated person- he awakes her love. We know little about the second Mrs DeWinter but she is developed here as a person who merely wants recognition- even to be enslaved because that will recognise her personality as a slave. The film adopts the tone of her memories towards 'Monte' as her boss terms it: so its sarcastic and notes the vulgarity of her boss's folly, the cigarretes stubbed out in food (something Hitchcock was fond of repeating the motif in his later film, To Catch a Thief). 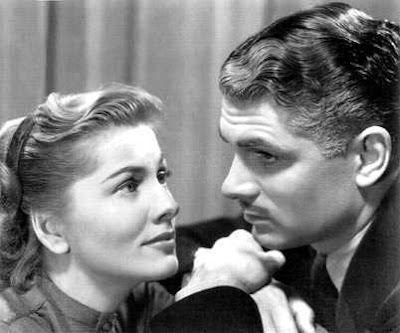 So we come to Manderlay- and so does Joan Fontaine. She comes in the company of yet another dominating personality- Maxim De Winter her new husband. Yet again he dominates her- completely overriding her personality. His family see her as unsophisticated, the servants resent her and her husband compares her to a child, upstairs maid and tells her never to grow to the age of 36. Her relations even with her husband are seldom natural. In a moment of sadness she says that she is 'gauche and inexperienced'. The truth is that she is gauche and inexperienced- treading uneasily onto everyone's feet- Maxim himself acknowledges that he is 'selfish' to her and isn't sure if they are companions. Mrs DeWinter though in this segment of the film is much less amused- much more tragedy and sadness dominates it- its an amazing depiction of the world as seen through an anxious mind and we can see that Mrs DeWinter really cares. The aristocratic characters with the exception of Maxim are no less repellant but they seem much more important. The coldness of the aristocratic world is what Maxim wants to escape and its what Mrs DeWinter is trying to grow into being able to cope with. The end of the film though brings a third arc in the story- because Manderlay the symbol in the film of the family inheritance and aristocratic pride and deceitful relations based on unkindness and infidelity is destroyed. The only way that Mrs DeWinter and Maxim can acheive a relationship is by breaking the veneer of social relations- the only times they are happy is when they are alone away from the aristocrats of the rest of the caste- and hence the symbol of that class must be destroyed for them to become true companions. I mentioned two arcs in the film- there is actually a third- the third arc is the dream described by Fontaine in the first moments of the film, returning to Manderlay she sees its charm, its wonder as a location, the wonder of aristocracy that attracted her both to become a companion and a bride, then the bright lights flare up then a shadow appears and then Mrs DeWinter wakes. Wakes out of aristocracy into adulthood. The film toys with all sorts of ideas about past and sexuality as well (Mrs Danvers Rebecca's maid seems to have a lesbian affection for Rebecca, handling her room and clothes with reverence)- but this structure of the three arcs and the way that Mrs DeWinter's story plays out through them is amongst the most interesting ways that the film plays with the idea of convention and its imprisoning effects- like an inverse Chinese doll, a poetic dreaming raphsody over the house of Manderlay expands into a comic interlude in Monte Carlo and then to a bigger vista at Manderlay itself- out of which Joan escapes to marriage- her outsiderness ends and so does her story. Tom Paine has written a very interesting post as one of the last guest posts to James Higham's blog. Tom argues that blogging particularly anonymous blogging is one of the most individual modes of expression- stripped of their identities, bloggers are revealed in their naked individuality- stripped of their identities as wives, husbands, mothers, fathers, sons, daughters, workers, colleagues etc. Rather than appearing like that it is the bloggers' opinions online- particularly the anonymous bloggers' opinions- that form their personality in the eye of the reader. Most of us do judge people functionally- by their relationships to structures within society- and amongst other people- on the net we examine people especially anonymous posters by the text that they leave on their own and other blogs. Tom's statement got me thinking- one of the interesting questions about this is the degree to which our personality can be emptied of that functionality. For instance my relationship to any woman is in a sense determined by the fact that I am male and twenty six- that means that I have a particular relationship to women that I don't have to men. I respond to women in different ways. Structure is actually useful for me in acheiving the ends that I have in mind as well- as a worker I need my colleagues to respect me in a certain way and to treat me professionally- no matter what they think of me in private. A colleague can dislike or dismiss me in private- but he has to work with me in the office because that is the function within which we operate with regard to each other. Functionality therefore helps us in many situations to advance our end- a kind of anarchistic interpretation of people where people are stripped of their functions would actually make living life more difficult. But let's go a bit further- is Tom right about functionality disappearing on the blogosphere? I don't think he is quite right actually- with frequent reading its normally quite easy to guage a blogger's personality, their function in the sphere. I will give two examples of the way that personality is established and ultimately almost controlled in the blogosphere. The first is ideological- Bloggers around the world are very keen to label- this blog has been labelled before in all sorts of ways that I would consider to be inaccurate. Iain Dale recently composed a list of the best blogs- in his opinion- he categorised them into Labour, Tory, LibDem and other ideological or partisan categories. Often bits of the blogging world tend to want to only debate each other- people want to make an argument about what conservatives should think about x in order to strengthen conservatism- not in order to find truth in a completely open way. The second way that blogging creates conventions which actually matters are the whole concept of the nettiquete. The British blogging world has seen the whole function of being a good net citizen has come up recently in all sorts of ways. Tim Ireland for instance has sought over the last couple of months to impugn the nettiquette of various rightwing bloggers- particularly Iain Dale and Guido Fawkes. One of the interesting things about Ireland's campaign is that he struck precisely at those two's reputations as good people on the net- leading many other bloggers to distance themselves from Dale and Fawkes. Another interesting example would be the high reputation that some bloggers- James Higham and Ellee Seymour come instantly to mind- have amongst those who disagree passionately with them but see them as good people on the net- both Higham and Seymour are the kind to throw you a link or offer a supportive comment. In many ways therefore online personalities like offline personalities are bound by conventions- they are just different- how should I treat those who regularly read and comment on my blog, with whom I have exchanged emails, who I actually know personally- all of us face fitting those kinds of people into our reading whilst also reading blogs whose owners we don't know but whose ideas we respect. Many of the features of the outside world in terms of creating functions for people into which they fit their personalities thrive on the net. Ultimately one could argue that it is very different to separate function from personality- very different to say where someone's essense as a father stops and their essense as Gordon starts or very different to see where someone's function as a good citizen of the blogosphere and general facilitator stops and their personality as James Higham or Tom Paine starts. I realise that this doesn't really critique Tom's article- but its more offering a thought which goes through his article and pulls some of his argument into further and what I consider interesting dimensions. Ultimately one of the problems that I face when discussing personality is separating the accidental from the essential- more and more I am coming to feel that it the accidental forms the essential- so that my status as a middle class white male whether I like it or not cannot be separated from my essense as Henry. Furthermore on the blogosphere that means escape is illusory- because its merely escape from that essense into another one- Gracchi- which I have created here. The distinction may lie in that Henry created Gracchi- but then again the second is dependent on the first, Gracchi's personality is a development out of the wishes and desires of someone who is governed ultimately by forces out of his control. Trying to separate personality from situation and function is in my view a fruitless task- Tom's right the Blogging world offers some escape but how full that escape is I'm not sure. Some of you may have noticed that there has been a little series of awards going on recently in a far away corner of the blogging world- anyway the organisers of said awards have announced and asked me to advertise as well as lots of other good citizens of our republic on the internet that there is an award ceremony attached to these here awards- basically because it was thought that too many people lived too far away from each other to all to one physical place- the best thing was to put the awards in cyberspace somewhere and what better place than second life, the new cyber space place where you can have, you guessed it, a second life. 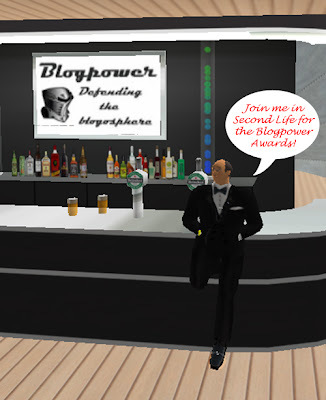 Anyway if you create a person at second life- and then click on this here link it should in all probability- so long as your humble blogger hasn't stuffed up the technical side again!- take you to where you want to go. Anyway I will try and be there- though my computer is complaining about second life so I might not manage it- but its this coming Sunday 2pm London time- so be there and you'll be able to enjoy the company of people like Tom Paine (pictured above) and others in this virtual world. All at Bits- I've recently written on the question of rings to denote virginity and the case in the High Court about it in the UK, defections from the Conservative Party, the succeses of Dutch football, Tony Blair's mission to Israel, the new Brown cabinet and the managerial crises at Real Madrid and Manchester City. Over at Nourishing obscurity- there is an article about why I can't spell and the costs to footballers of the second world war. More will appear on this blog soon- apologies I've been very busy recently but I will try harder to get stuff up here as well! Well that's my last two articles at Bits anyway- one on why class translates to the web is here and a film review of Evan Almighty is also up. Cameron Diaz offended lots of people recently by wearing a Maoist slogan on her bag whilst in Peru. What's interesting is the way that this reflects a preoccupation amongst western liberals with the idea that in some way the Communists were fine- they were ok- that rumours of camps where women were starved so far that their uterus's fell out are nothing, that making an omelette involves as one leftwinger once told me breaking eggs. Well the move deserves condemnation- I've tried to work out some of the reasons why many people within the West find communism less objectionable than Fascism here- most of it I think is down to historical experience and the difference between fighting a cold and a hot war and the difference that that makes in terms of popular and intellectual attitudes to a creed. Its noteworthy that for many of the most clearsighted during the forties like the socialist George Orwell Communism was always seen as as evil as Fascism and to their credit it was many on the moderate left- characters like Orwell, Ernie Bevin, Denis Healey, Dean Acheson, Harry Truman et al who stood up to Communism, just as many of the figures on the right stood up to Fascism- Winston Churchill would be a classic example. I do think though that one of the interesting facets of this that my article doesn't dwell on is the way that totalitarianism breeds on itself. The presence of Communism made Fascism a more palatable option to the far right in thirties Germany. Later it was the presence of Communism that allowed such siren voices of illiberalism in the United States as James Burnham, McCarthy and others to flourish. McCarthy and his scions made many liberals into communists- dividing the world into those with and against us often does that. What Orwell realised is that there is a moral choice but the moral choice to be taken is against totalitarianism of any form- one of the more difficult things to persuade people of today is that often (though not always) repressive laws actually rebound- they create as much unrest as they attempt to solve and they give the state an appetite for being repressive. Such an effect leaves society like a drunken man on a horse lurching from totalitarianism to totalitarianism. Ruthie Zaftig is a thoughtful right-winger, often I disagree with her but ultimately her writing is informed by a basic decency which it is find not to find appealing. Reading her guest post at James Higham's blog her decency is the first thing that emerges- but still its a post that requires some thought- Ruthie isolates some problems with journalism but I think her argument needs to be taken a little further than she takes it. Ruthie believes that the problem with the way that news is disseminated lies in the fact that there is too much punditry and too little journalism- respectfully I disagree- not that there is too much punditry there is, but more journalism isn't quite what we need either. I agree completely with Ruthie that there is too much punditry around- too many Bill O'Reillys talking rubbish on the television, too many Keith Olberman responding with insults, too many films like last night's Trial of Tony Blair on British TV, too many Peter Hitchenses or John Pilgers who can only see one side of the question. In the blogosphere the problem arguably is even worse- for every Ruthie, you find a dozen who shout more and think less, for every Matt Sinclair you have an idiot with a keyboard and without a brain. Punditry in my opinion is an exercise in the absurd- it reduces tv to what Ed Murrow feared it might be, wires in a box, which have no merit. If popular its popularity is the popularity of Cleon, of the leader of a mob, and the frenzy of its protagonists demonstrates the proposition advanced by Plato that democracy would be a tyranny of the majority. But journalism in many ways contributes to the problem. Journalists are ultimately gatherers of information- often unconcerned with what the information means. Iain Dale is the typical British exponent in the blogosphere- Dale presents good information from his political contacts but in my estimation doesn't analyse or place it properly. Newspapers do this too reporting data without providing this contextualising detail- to take an example- one can see the consequences of reporting without context in the way that the blogosphere recycles news- this post by Lord Nazh over at Nourishing Obscurity is about Israel and purports basically to find that Israel is "a country defending itself against terrorists"- of course it is but he neglects to mention the context of the events before 1948 which make the Palestinians feel that their land was robbed. Lord Nazh is indeed right about the facts but neglects to mention either the events before 1948 or another fact that more Palestinians than Israelis have been killed over the last five years. Those facts don't excuse but do help explain what has happened and why a peace process is necessary- but reporting without analysis can lead you to support Lord Nazh's conclusion that the terrorists are to be opposed, rather than seeing that the situation is much more complex. Ultimately more journalism isn't what is needed at the moment- but more analysis. Analysis would obey all the rules that Ruthie sets out in her post- it is as she argues it should be- something which is self critical, an intellectual discipline rather than an emotional spasm. Our problem is not that we are not bombarded by enough random facts about the world- but that we don't have patterns or ways to understand those facts through. Instead we understand them through the ignorant ramblings of pundits. To see the difference between a pundit and an analyst look for example at the contrast between your average football pundit and James Hamilton- the first is emotional and prejudiced, the second rational and able to take criticism. Of course analysts get things wrong but because they are willing to take criticism they will acknowledge that they are wrong- that difference is a vital one- and acknowledging and not shouting back in debate is also key. Ruthie is right and wrong- I think her definition of journalism includes the people I style analysts but I think it risks placing a premium on just getting the facts without attempting to place those facts in a context. Ultimately though the broad purpose of her article is right- all power to interlocutors like Ruthie- this blogger enjoys talking to them and learns from them!